Wireless charging is slowly but surely becoming the norm for smartphones, which means it’s a great time to be a company that’s focused on producing reputable wireless chargers. In other words, it’s a great time to be Belkin. A few days ahead of CES 2018, the charging device company has unveiled its full line for 2018. There are a couple of wall-chargers and a trusty new power bank, but Belkin’s lineup makes no secret of the fact that the company's chief goal is to gain a bigger foothold in the wireless charging market than it already commands. 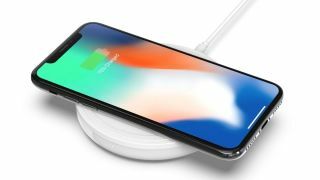 As usual, there’s little need to worry about compatibility with wireless charging from Belkin, as the company affirms that the whole line is compatible with devices like the iPhone X, the Samsung Galaxy Note 8, and virtually all other devices that are compatible with the Qi wireless charging standard. For starters, there’s the new Belkin Boost Up Bold Wireless Charging Pad, which comes in a “variety” of colors for device matching and delivers a 10-watt charge. It’ll hit stands sometime in spring or summer. If you’re not that much of a pad person, you might prefer the Belkin Boost Up Wireless Charging Stand, which supports both landscape and portrait charging modes and also delivers a 10W charge. It's basically the same concept as the pad, but the stand allows you to let the phone serve as a display for an alarm clock or viewing screen while charging without laying flat. It, too, will be out in spring or summer. Beyond that, Belkin offers a range of devices that cater to almost every circumstance, whether it’s the Boost Up Car Mount for wireless charging, which offers 10W charging power and can be mounted on a dashboard or windows; or the Boost Up Dual Wireless Charging Pad, which can charge up to two devices at once. Both will be available sometime next summer. And if you’re a business owner who wants to allow customers to charge their devices at various spots? You’ll be interested in the new Boost Up Wireless Charging System, which offers a connected system of charging pads that can be used in conference rooms, restaurants and similar locations. It, too, will be available next summer. Aside from wireless chargers, Belkin is also offering the Pocket Power USB-C 10K as its sole new power bank. It’s a handy little device that can fit in your pocket and charge 3.0-enabled devices up to 80% within 35 minutes. It’ll be available sometime in spring. For those who prefer the speeds of a wall charger (or use devices like the Google Pixel 2, which doesn't support wireless charging), Belkin is offering a new 27W Home Charger that offers the best charging speeds available. If you want to charge two devices at once with a wall charger, though, then you'll want to pick up the Dual Port Home Charger 27W. The only catch is that the device’s USB-C port charges at 27W while the USB-A port only charges at 12W. It’ll be available sometime in summer. Belkin didn't reveal any of the prices for the devices, but it's likely that we'll learn the cost of these chargers during CES next week. Want even more wireless chargers? Check out our guide!